Dan “Ever since I took part in my first triathlon back 2010 at Blenheim, it had never crossed my mind that I wouldn’t complete the race even in the most darkest of times during the run. That was until November last year. It was the first ever half Ironman distance in Dubai and Dad had flown over to race even though deep down we both new he would never complete it. This was solely due to the fact he had about 6 degrees of movement in his hip before the involuntary electric shock manuovere was activated. If you spent any time with him towards the end of last year you will know what I am talking about. It’s funny now but at the time it definitely wasn’t. With that taking up most of the conversation prior to the race, never did I once think that I could also be in danger of not completing it. 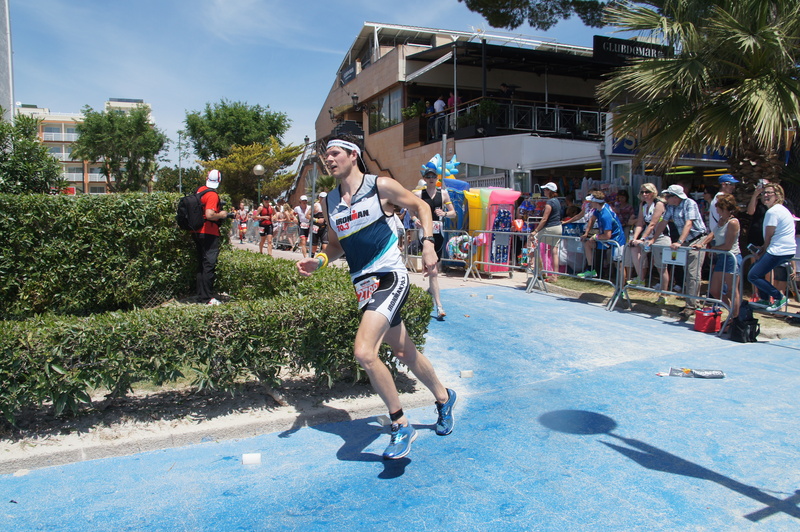 To be honest, I wasn’t confident in having a great day as I hadn’t put in enough hours, but having raced in Mallorca earlier this year and leaving a bit disappointed, I was determined to leave everything I had out there and try and nick a result. My wave started and we began the swim but around the 1k mark I was beginning to feel very sick. I am not sure whether it was nerves, the sea water or the jel I had just taken before the race, but it wasn’t enjoyable and cost me a bit of time without a doubt. I exited the swim around the 36min mark and relatively happy all things considered. I really enjoyed the bike course as it was on a road I use when driving all the time. Up and back down Hessa street 3 times with a tail wind going up and a headwind back, I had a lot of fun. 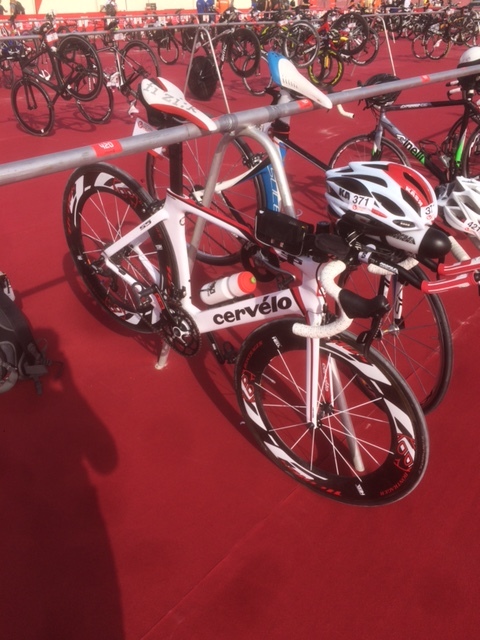 The only issue was that I felt the need to consume 6 – 7 gels over the 2 hours and 47 mins I was on the bike. There are millions of different articles and pieces of advice you can find on the internet about best practice and rule of thumb when it comes to nutrition, but I can tell you right now, that is way too much. So off I went running at around 5.10min k pace which is slow but I was very happy to stay at for the first 5k. Its worth pointing out at this point that it was around 10.30am and the weather was around 32 degrees C. You don’t have to be a rocket scientist to know that is bloody hot and not ideal when you’re about to embark on a half marathon. Even less ideal when you’re unaware of what is just around the corner. The first couple of k of any run off the bike is tough while you get your legs used to the change in motion and your heart rate a steady pace. But by 3k I was still not feeling good, and by 4k I was feeling worse. Then my stomach started playing games and by the 5.25 turnaround point it had enough. I spent the next 15.25 kms following a clockwork routine of Run, Puke, Walk, Run, Puke, Walk. To say it was rough would be a rather large understatement. Even in the best conditions that is not something you want to go through, but when its beaming sunshine and every bit of energy you had stored is now plastered across the crescent of the Palm, it’s actually quite dangerous. I was unable to consume anything aside from water and even when I did that, I saw it again moments later. I still don’t know how I managed to get to the end but I stumbled across in 5hrs 43 mins and 46 seconds. 23 seconds slower than Mallorca earlier in the year and a 2:15:55 half marathon split! Ouch! It took me a good while to recover from the race and that gave me time to reflect on what happened. This sport is bloody tough and if you want to do it well there are no shortcuts at ANY level. Although the nutrition issues played a key role in my day, I was 100% guilty of showing a lack of respect to the distance and I said to myself the next day that will never happen again. Its a bit of a cliché but how often do you hear people say that you learn more from disappointment than success? It’s thrown around all the time particularly with sport but in my case it couldn’t of been more true. I looked at what I was doing and what I wanted to achieve in the sport and decided that I needed a complete overhaul. I realised I wasn’t happy just being a middle of the pack athlete and needed to do something about it particularly with training structure and planning. My answer was simple. I needed a coach. I found my guy and met him 2 days later. 3 days later I had my first assessment session and by the end of the week I had started my personalised training plan all structured towards my next race which was 4 months away – Challenge Dubai. We looked at my weaknesses and technique and worked out how I could get the most ‘bang for my buck’. Like most age groupers I have a pretty unpredictable job which means I have to be flexibile and plan my sessions in order to get the most out of them. Before I would just rock up to the gym with no plan or just head out on a 10k run at one pace not knowing if it was really helping me improve. Having a weekly plan allowed me to plan around my work and social life and gave me the confidence that what I was doing was working. 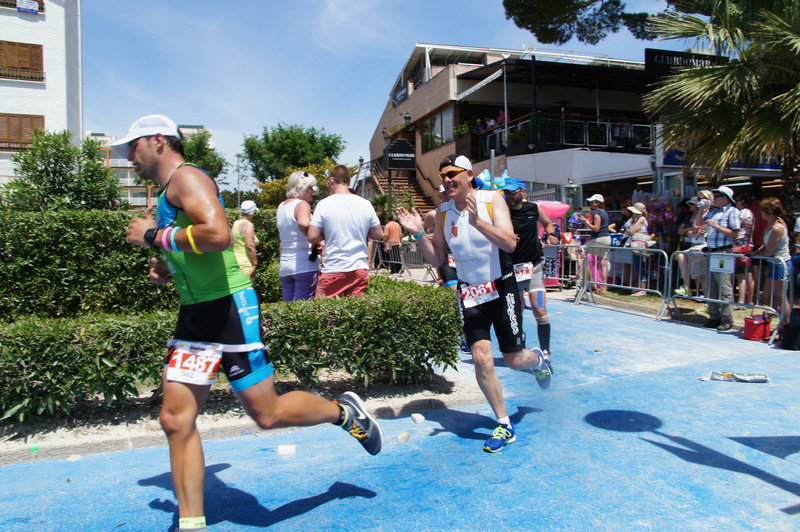 This proved to be pivotal in my improvement as it relieved the mental stress I was putting on myself regarding training – one of the biggest issues age groupers come up against in this sport. 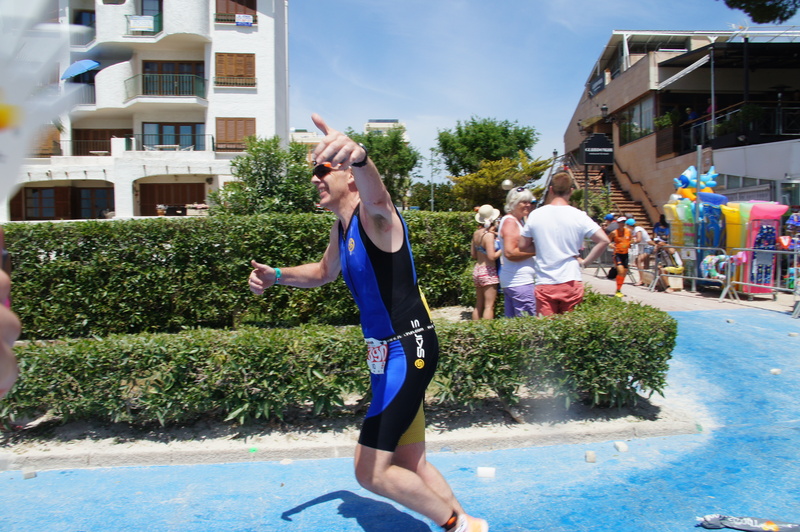 Aside from the Christmas period I pretty much trained everyday in one shape or form but averaged around 6 hours a week in the 4 months – almost half the average when I was training for Ironman. Obviously its worth noting that I was only training for a half so that would make sense but I knew deep down that this was the fittest i’d been for a long time and was only really lacking the endurance needed for a longer event which you can only get from hours and hours in a low heart rate state, or what’s otherwise know as f***ing mind numbing training! February came and I got my usual chest cold 3 weeks out from the race. This was another bonus of having a coach as he helped me understand that it wasn’t going to effect my fitness level enough to make a difference and that all the bulk of the work was already done. 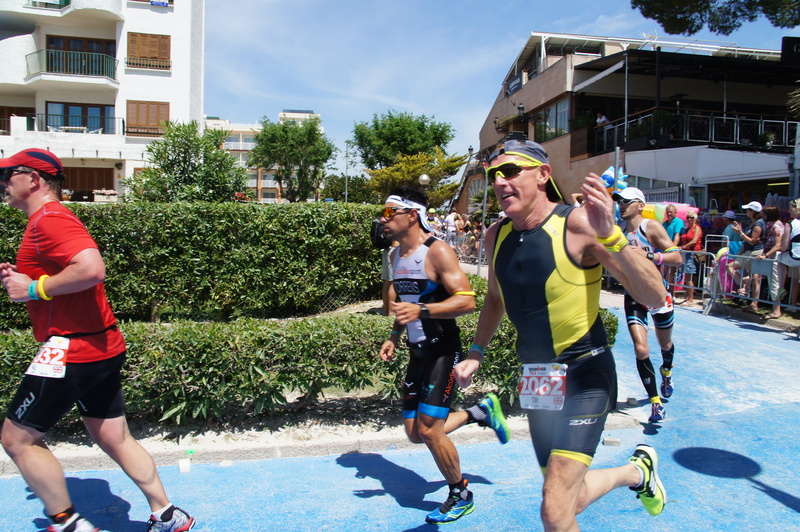 The stress I put myself through before Ironman France when I thought i’d lost all my fitness in the 2 weeks leading into the race was actually probably more detrimental to my performance than the illness that I caught. Stress is literally the number one evil and the more you can limit it the better you will become. We put my plan together which included my nutrition and HR zones and I was ready to go which was something I had never done before, particularly with nutrition. I removed gels altogether from my plan and stick with solid food and high calorie chews.My relationship with jels has now come to an eternal end. Feeling excited, I woke up on the morning of the race and the weather was like nothing id seen before in dubai. The wind was blowing at speeds up to 50kmph and the sea was like something you’d expect to see on the coast of Australia, not in Dubai. As such the swim course was moved inside the bay and became 2 loops. I was actually really relaxed for some odd reason, perhaps it was that I knew I had done the work and stress levels were low I don’t know. The pro’s went off first and were thrown around like rag dolls in the 3ft waves. I was still very relaxed. The swim was as rough as it looked. So much so that I came out in over 40mins and way off my target time. 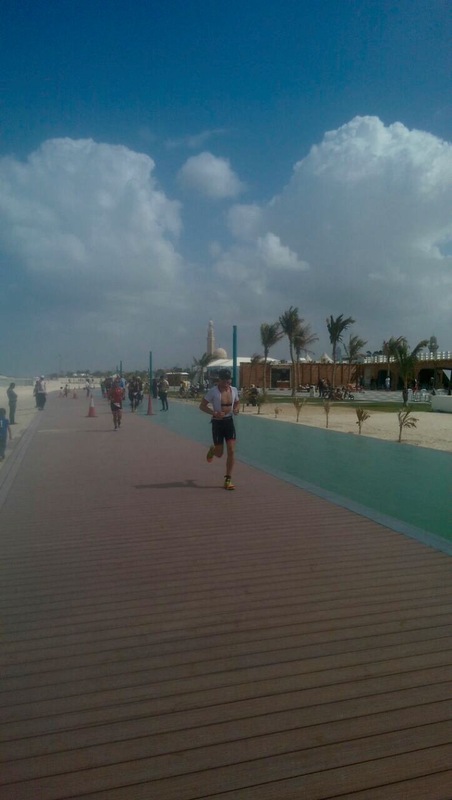 While I was annoyed I knew there wasn’t anything I could do apart from bike hard and run harder. So that’s what I did. By the time I had reached 45km split averaged around 39kmph. Granted there was a pretty big tail wind for about 30km of that but the other 15km was made up of horrific side wind that actually blew people off the bike. I knew that was fast as it was way beyond what I planned but I was well within my HR zones that I set out with my coach before the race. Happy days! 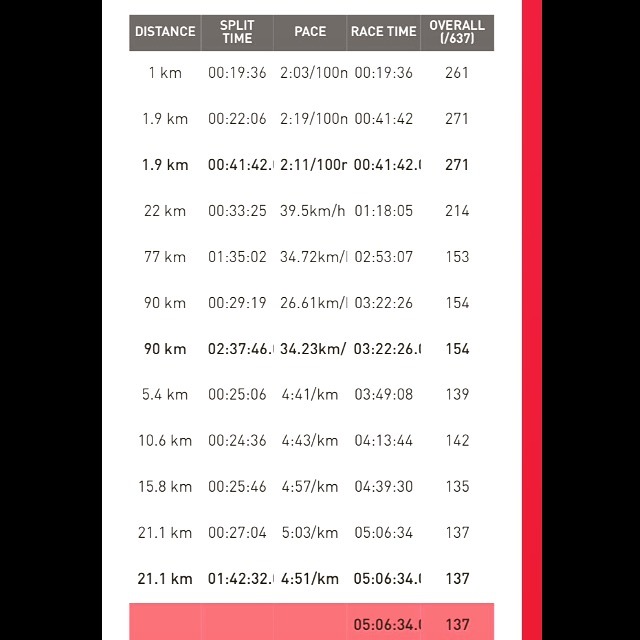 The way back wasn’t so enjoyable into huge headwinds but I managed to hold on and get to t2 with a 2:37 bike split and an average of 34.2kmph, whilst also nailing my nutrition. Buzzing! It was at this point where I told myself to just stick to the plan on the run. Stay in my zones planned and if I have anything left at the end use it. And that’s exactly what I did. Looking back at my data my HR pretty much stayed between 3 beats of each other the whole way (155 – 158 between zone 3 &4). That might not mean much to you but to me and my coach that was amazing as it allowed me to stay just below threshold and at the same pace for the whole 21k. I had executed my plan perfectly and as a result ran my fastest ever half marathon off the bike (1:42:32) and was over the line in 5:06:34 (9th in AG). As always, when you look back at a race, you ask yourself could I have done more here and what if I did that there, its inevitable and this was no different. But for me, this was my first real breakthrough race i’d had and it really showed me what I could acheive. In all honesty, I hadn’t really changed much in terms of hours trained or types of exercises over the 4 months, in fact, I probably did less and kept it simpler than before. The real difference was that I highlighted what was the real factor in the way of me improving and resolved it. I worked out I needed a structure to suit my life and eliminated the mental stress I was putting on myself. The result speaks for itself. I’m now planning the rest of my year and working out what races to do. Last weekend I did a sprint where I managed to get 8th place (out of 71) which was really fun – 1 hour 20mins of full on pedal to the metal. Sadly though that was the last triathlon here until October but in truth there is a lot I need to work on before I race again later in the year. 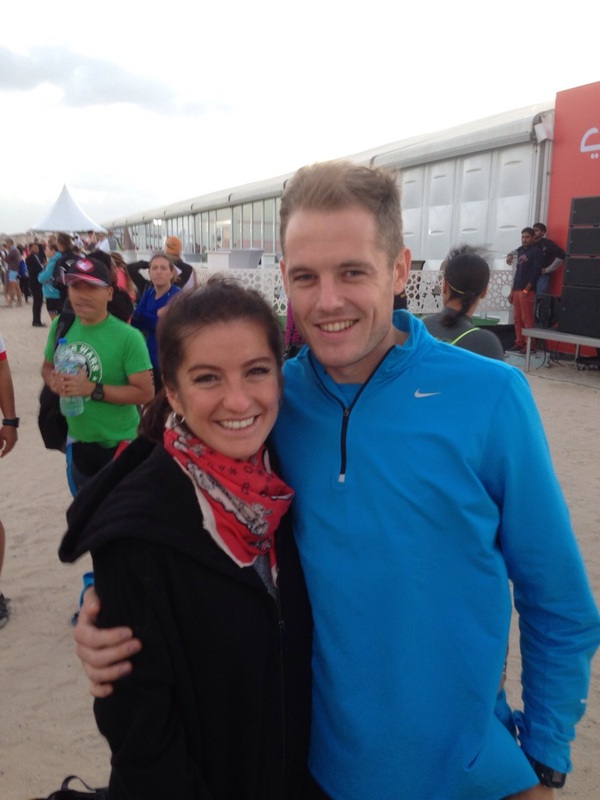 The race in Dubai managed to raise another 90 quid for Headcase which was brilliant but we need CAN and MUST do more. We’ve all put so much into this over the last few years achieved great things. Now is the time to evaluate where we are going and and what we need to do in order to take this to the next level, we can’t stop! The triathlon bar has been raised and new targets have been set. Let’s all analyse what we can do to raise the fundraising bar and make 2016 the year of breakthroughs. Headcase update – coz that is why this blog is here! Since 2012 the funds raised by all those who knew Colin or the extended family of friends who watched his diagnosis with GBM Brain cancer until his battle was finally lost in the summer of 2013 have supported raising over £45k (10%) of the funds quoted below. 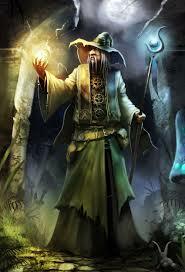 More wizards doing wizardly things….. This time we’re providing funding of approx £68,000 for a 2 year project entitled ‘Engineering Novel Endocrine Therapies for GBM’ (quite). In Normal Person English (as opposed to Wizard speak) that translates to stretching nano-fibres to a width of around 1/1000th of a mm so they can pass through the Blood Brain Barrier (try saying that quickly!). This is really important as the BBB stops stuff getting to your brain, like drugs (weirdly it lets LSD through though… go figure). What the Wizards will then be doing is attaching drugs to the nano-fibres so that they are pulled through the BBB quicker (important for some drugs as their potency runs out in minutes), and in greater quantity (important for other drugs as normal amounts, to have an effect, are poisonous to the rest of the body). If successful, this will then allow said drugs to target the GBM specifically and inhibit its growth and stop it invading healthy brain tissue. ….. and before anyone says it attaching the drugs to LSD so it takes them through the BBB isn’t a sensible option! A chance internet search and phone call has led to Headcase providing funding of around £100,000 to the John van Geest Cancer Research Centre at Nottingham Trent University for a 3 year Research Project! This is a potentially ground breaking project that if successful could lead to clinical trials within 5 years. Well it really is wizardly stuff…. they have already discovered an antigen protein present in GBM called HAGE (it’s also present in aggressive breast cancer). HAGE it would seem is a target for a potential vaccine against GBM i.e. the vaccine would stimulate the immune system to ‘kill’ the GBM. There’s a lot of interest in ‘Immunotherapies’ and personalised medicines for cancer at the moment particularly as they are less toxic than existing therapies. We’ll keep you updated on their progress. We’re awaiting results from test taking place at the University of Bergen, which if successful, will mean that we can start a 2 year trial of around 100 patients using Clomipramine. Current ad hoc evidence shows that Clomipramine extends survival time for GBM to years rather than months with a good quality of life. If the Norwegian tests are successful we hope to start the trial in June/July. OK so every now and again a little challenge presents itself…..thinking I had pulled a groin muscle at Blenheim it turns out that wasn’t the case (still finished 2nd in age group) however from then on the niggle has always presented a problem about 4k on the run…..It messed up my attempt to qualify for a GB age group bib but I still went to Dubai and tried a half ironman, completed the swim and cycle but no chance on the run….first time I have ever got a DNF !. Back home and needed to sort…..result total hip replacement on the 15th December….target agreed with surgeon Blenheim on the 9th June….so a bit of a journey ahead but determined to win…..Headcase is still the charity I will support and hope that as the journey unwinds you will be with me….and decide if its worth a few quid cos its still a very worthwhile charity…on the 9th at Blenheim it will be a special day and one I cannot wait for. Anyhow that’s it I will get sorted and then continue my quest to see of this terrible disease…cheers for now !!!! It’s not over till the fat lady sings. Did you think they’d go quietly? So the last race of the season looms large. And what a difference 5 months makes. It was barely a month after completing the Mallorca that Tony suffered searing pain in his hip and soon after that the news it was arthritis. Not good if you use your hips regularly under pressure! The hope for GB qualification at Liverpool followed a no show at London to help conserve limbs. But it was not going to happen so focus was on Bala in September. If the trip to North Wales wasn’t a challenge enough the event was an immense challenge but even loaded up with painkillers the run was particularly nasty. Either way an impressive finish time and a 8th place, tantalisingly close but not good enough for a GB bib. A gel sort of thing injection later and training was resumed… but still the pain. So with Dan always threatening Asthma attacks and also nursing a dodgy knee…. 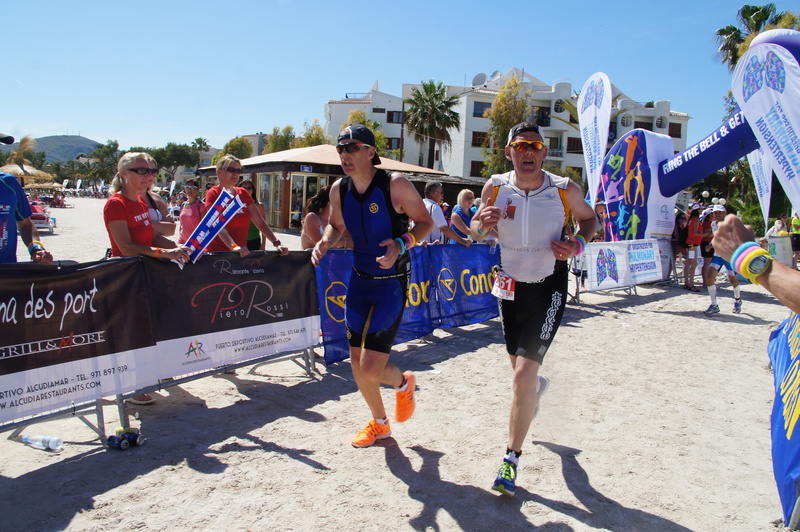 The inaugural Dubai Triathlon takes place on the 7th November and the boys are tooling up, health wavering but determined to put in good times.. or at least complete it. 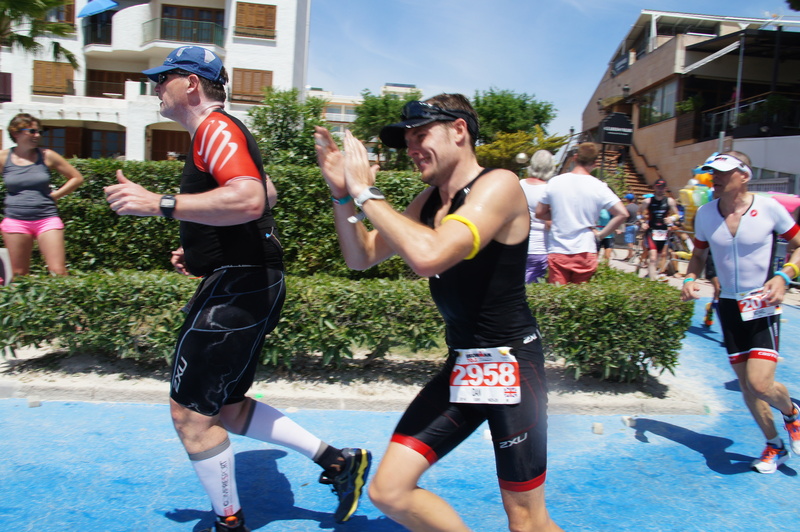 It’s been a year of great highs with the whole Team Russell finishing their half Iron Man in Mallorca with Peter and David crossing the line together and the lows of injury and what could have been’s. But what they all want is to reach the end of this year with the magic £50k for Headcase. So many have done their bit, Andy and his row, Kirstin abseiling down the Lloyd’s building and the Russells have expended huge levels of resilience and energy. So if you can just dig into the piggy banks, down the back of the Sofa’s, bottom of handbags and sports lockers – just please help the journey end on a high for all those involved and for the research into this killer disease. Whatever happens leading up to a race it centres around the training the nutrition and the injury prevention. Life still goes on and the chores and duties still impinge on training sessions. The lift of the spirits with a little internet shopping for new wardrobe changes on the course, shoes, Singlets, Shorts, Wetsuits, shoes and more shoes, in a variety of weights, materials and most importantly colours, means that the delivery of parcels to work addresses from Wiggle and Active Instinct would press for the request for David to negotiate a better rate from DHL! But it was worth it, the smiles on faces, the exhaustion mixed with elation, the relief and the hunger to do it all again… it’s like child birth! (trust me guys it is!) 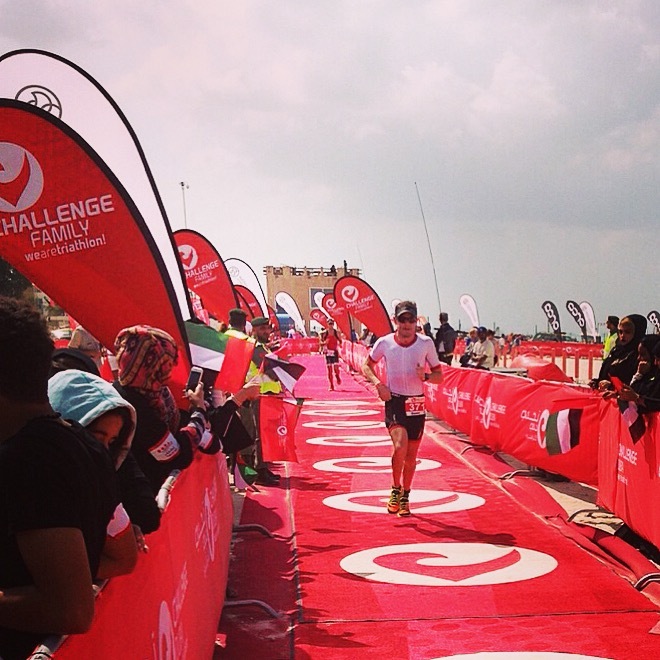 So within 24 hours of touching down on Terra Firma Dan has dangled the challenge carrot by signing up to another half Ironman in Dubai, so November it is Guys. Who’s in. well frankly I think anyone would be forgiven for deciding to miss this one, but with this bunch of fitness masochists its anyone’s guess. Alas the biproduct one hopes for is a little toning and weight loss, neither has appeared thus far, but I am hoping a corner will be turned soon. 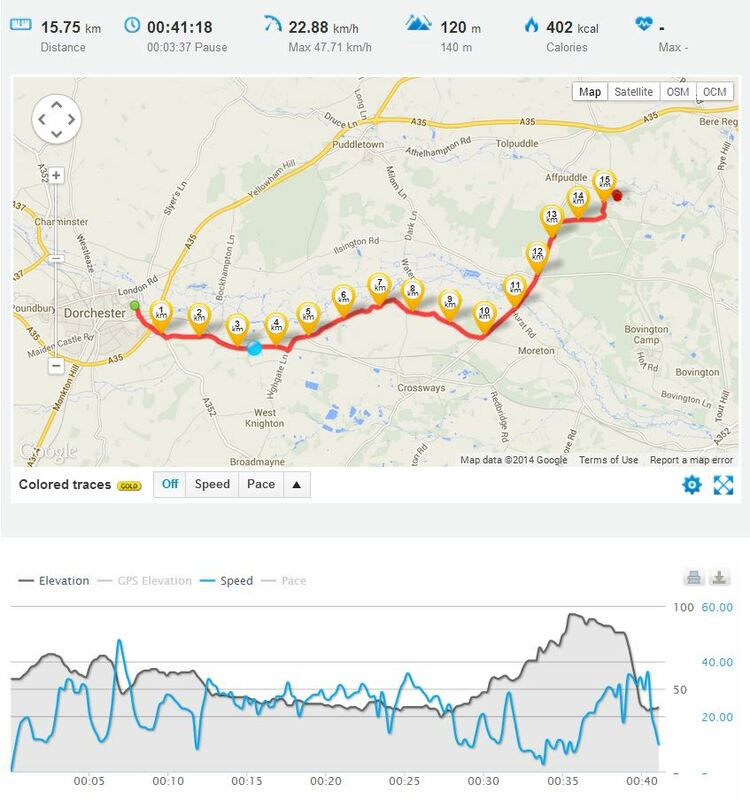 I cycled to work today – the long way – and we have hills in Dorset I have just discovered! Suffice it to say, anyone who gets up regularly to train, then decides to push themselves to the limits, whilst having a life, to be able to perform on a single day, whatever the prevailing injury or ailment – including age – has my RESPECT. So Tony, Peter and David – hats off, it was a privilege to watch and an inspiration. Dan and Andy a quick doff – After-all you are 30 years younger and should be running for your life and curtailing long drunken weekends of enjoyment! An emotional weekend, great choice of location – topped up the tan … amazing. Now cough up some more dosh so we can reach £50k and put an end to the insanity! 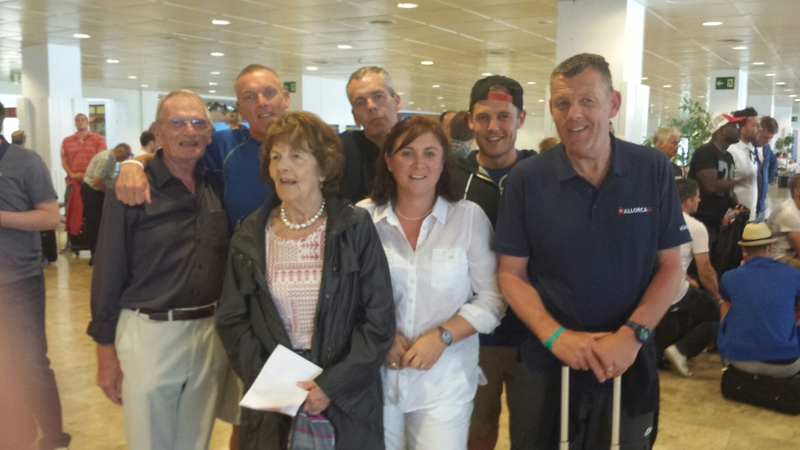 Diary date – 25th July – Rowing 750 miles – just to throw a curve ball! More info to follow.